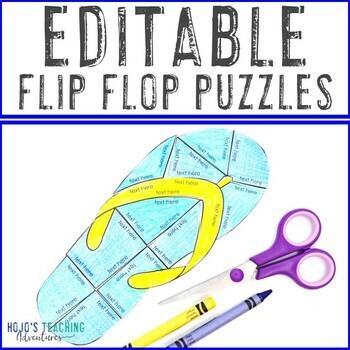 EDITABLE Flip Flop Puzzle: Make Spring or Summer Activities on ANY Topic! 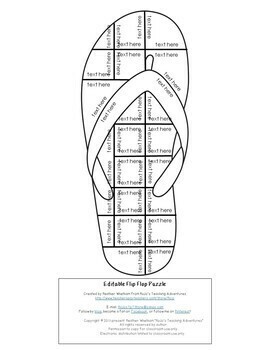 Let your students practice various skills with this fun EDITABLE Flip Flop Shaped Puzzle. These are a great way to engage students on various tasks. 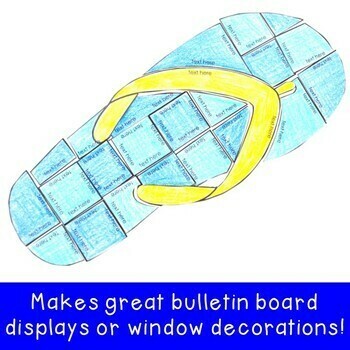 Use them for back to school, summer, the end of the school year, during an "I Hate Winter" lesson, or anytime you want some flip flop fun in your classroom. This puzzle will have students match 27 different problems together by correctly putting the 22 piece flip flop together. You need to create the puzzle, so it will fit the needs of YOUR students! Teachers in 1st, 2nd, 3rd, 4th, 5th, and 6th grade have used this puzzle with success. Check out the preview file. This is a PDF, but it will help you understand how the puzzle works and whether it's right for your students. You get one puzzle in this download. It is an editable puzzle with 22 pieces. 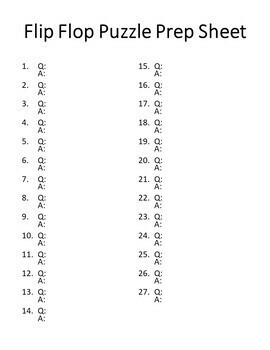 You will make the 27 problems to fit the skill/s your students need to focus on. You can keep changing the problems to use this puzzle over and over again. Use these puzzles anytime you need a fun activity - particularly for the end of the school year, summer school, or back to school. Any time you want some sunny summertime fun, this is it! These puzzles are meant to be somewhat of a challenge - which is perfect to promote a growth mindset. Students will have to keep in mind the shape of the flip flop and persevere if the task seems challenging. Tell students to rotate the pieces around and analyze what they can do differently until they fit. This is where their critical thinking and 21st Century skills will come into play!